credits of "The Dukes of Hazzard" as many remember him. It was one of those shows that really was hard to describe because it really was like nothing else. Combination comedy, at times drama, adventure, and music, "The Dukes of Hazzard" entertained viewers Friday nights for the better part of seven seasons. The show focused on the exploits of Bo and Luke Duke, two cousins who were reformed moonshiner runners tearing around the countryside with the General Lee, one of the coolest cars on TV. Standing in their way of, I’m not really sure what they did, was the bumbling sheriff with the golden heart – Rosco P. Coltrane. He, under the orders of County Boss Jefferson Davis Hogg, always tried to get them to violate their probation, which meant they could never carry fire arms or leave Hazzard County. In the end, they always got the best of him to live on and break up the next scheme cooked up by Boss Hogg and Rosco the next week. Rosco P. Coltrane was top of mind recently because James Best, the actor who played him, passed away. The Dukes of Hazzard only came to my attention after one of my classmates started watching it and talking about it Monday mornings on the bus ride to school. Shortly after that, we had company one Friday night. As we were winding down after everyone left, we flipped to Channel 13 and "The Dukes of Hazzard" was on. I was struck by the narrator, who I later discovered was musician Waylon Jennings. The episode centred on Cooter the mechanic, Bo and Luke’s good friend, who decides to steal the President of the United States’ car when it stops at his shop. From then on, I recall watching it regularly, although like all shows on peasant vision it was not always on at the same time. I remember watching it Sunday afternoons for awhile, as an example, and in the summers well after midnight. It gave me something to talk about on the school bus, and we even played "Dukes of Hazzard" on the playground. I was Bo and my buddy was Luke, primarily because I was blonde and he was a brunette. I loved the car chases through trees and water on back country roads, and the General Lee jumping over water and ravines. I read an article in TV Guide about what went into the making of those jumps. The show had purchased hundreds of Dodge Chargers, but only used each car once in a jump. The stress of landing was too hard on the car to be used again. To illustrate the point, the article was accompanied by a photo of a grave yard of cars. Leaning up against a wall were dozens of car roofs with the Confederate flag painted on them and dozens of car doors with that distinctive “01”. Each time they used a car, they cut off the roof and removed the doors to prevent scavengers from trying to make money off the cars. Coincidentally, one of my cousins in Brooks also had a Dodge Charger. I also loved the hood slide every time Bo and Luke were in a hurry to get in the car and on their way, and the fact they always came out on top. I’m a sucker for a happy ending. Rosco P. Coltrane with one of his classic expressions. In order to have a happy ending you have to have conflict, suspense, and a villain. Few viewers like the bad guys on TV but actors love playing them. 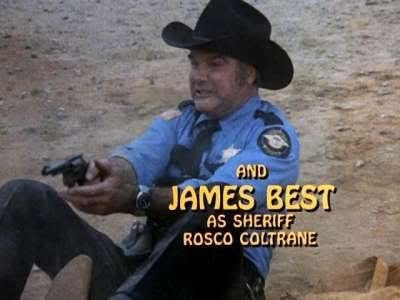 James Best always looked like he was having fun playing Rosco. He even developed a distinctive voice for the character. I remember the first time I heard Best speak out of character, and the difference was quite striking. Rosco may have been corrupt, but he loved his dog and his sister, probably in that order. He played the part tongue planted firmly in cheek too. He may have been perpetually trying to get the Dukes into trouble, and was a key player in most of Boss Hogg’s schemes and scams, but it was hard to take him seriously. He was more like a cartoon bad guy than a true villain. “Dukes of Hazzard” has been top of mind lately because it has been censured for its use of the Confederate flag on the roof of the General Lee. According to website Fox 411, the uproar over the flag began after nine African-Americans were shot to death during Bible study at the Emanuel African Methodist Episcopal Church in Charleston; photos of the white man charged with their slayings showed him displaying the Confederate flag. Recently, the Confederate flag was removed from the grounds of the South Carolina Statehouse. TV Land also pulled episodes of "The Dukes of Hazzard" it had been running. Although they make a point, it really is hard to take a show seriously that never took itself seriously. It was the definition of a bunch of good old boys having some down home fun. A lot of the time, it was more of a real life cartoon than an adventure show. 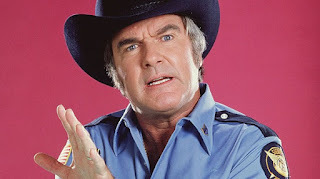 Rosco P. Coltrane was the perfect cartoon antagonist. He was bumbling and incompetent, but still competent enough to be dangerous. It kept us all coming back week after week, even though deep down we knew how it was going to end. And that's what made James Best's portrayal so memorable. I do wonder what Rosco would think of all this though, TV Land pulling the show after all these years. He’d probably have to ask Boss Hogg first.